Mocking efforts at forging opposition unity before the next general elections, he said: "When there is a flood, all creatures climb to one spot for survival." 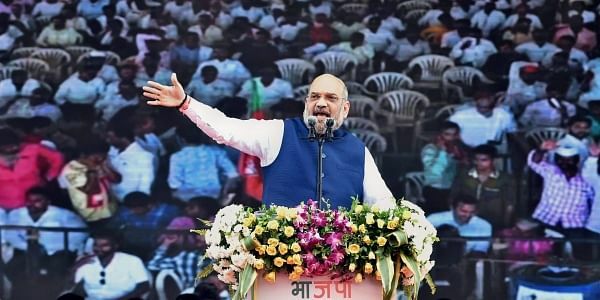 MUMBAI: Launching its election campaign for the 2019 elections, BJP President Amit Shah on Friday urged party workers to take a pledge to ensure it retained power with a full majority to help achieve Prime Minister Narendra Modi's dream of 'New India'. Addressing a rally here to mark the BJP's 38th Foundation Day, the Bharatiya Janata Party chief said the countdown to the Lok Sabha elections had begun and called upon all activists to fan out to each village to highlight the Modi government's achievements. "We don't want to fight the next elections on slogans or empty poll promises but on the basis of the government's achievements," he said. "We should take a pledge to ensure a BJP win in the 2019 elections and in Assembly elections in Odisha and West Bengal and later even return to power (Chief Minister) Devendra Fadnavis' government in Maharashtra. It will be the dawn of the golden period of the BJP," Shah said. Mocking efforts at forging opposition unity before the next general elections, he said, "snakes, mongooses, dogs and cats" climb together on a single tree trunk for refuge, as there are deep waters below. "The political flood unleashed by (Prime Minister) Narendra Modi has made all these snakes, mongooses, dogs and cats, join together and unitedly contest the 2019 elections against him," he further added. However, barely an hour later, Shah clarified that what he implied was parties with different ideologies joining together to fight the upcoming elections vis-a-vis the BJP and Modi. "What I intended was that the parties with opposing political ideologies which could never come together have united... They include BSP-SP (the Bahujan Samaj Party-Samajwadi Party), TDP-Congress, Congress-Trinamool Congress, etc.," Shah said at a media briefing later. "However, if somebody has felt offended then I am naming them all now, there is nothing to feel bad about it. Kindly don't twist my comments out of context," Shah, apparently on the backfoot, appealed to the media. The BJP chief's utterances unleashed reactions and debates on the social media, with even veteran actor Nana Patekar joining in, asking that the Congress should at least get credit for ensuring democracy survived in the country. Shah, however, carried on his attack on Congress President Rahul Gandhi -- calling him Rahul Baba -- the BJP chief said he has been given an "injection" by (NCP President) Sharad Pawar so that now he's going around asking "what Modi has done in the past four years?" "Rahul Baba, we want to ask you -- What did your party do when it was in power for four generations? The people want to know," Shah said. As for Gandhi's fears on the Scheduled Castes and Scheduled Tribes Prevention of Atrocities Act, Shah reiterated that the BJP would "never do away with reservation in the country and will strongly oppose if any other party attempted to". Highlighting the NDA's achievements, he said the BJP had provided a "clean, non-corrupt and all-inclusive" governments which the corrupt could not do for decades. He listed schemes that he said had benefited the poorest of the poor in the country, the Rs 500,000 insurance for 50 crore poor families, electricity connection to 10 crore homes, and unprecedented higher remuneration for agricultural produce.